Make a summer’s day all the more perfect with a tailor-made linen shirt for men. Wherever you are, at the beach, a barbecue, or rooftop bar, relax in style in a cool and airy linen shirt. Even in the hottest weather, you’ll feel confident, fresh and turn heads in a linen made-to-measure shirt. New to linen shirts, or looking for some inspirational style options? Browse our stunning collection of men’s linen shirts. 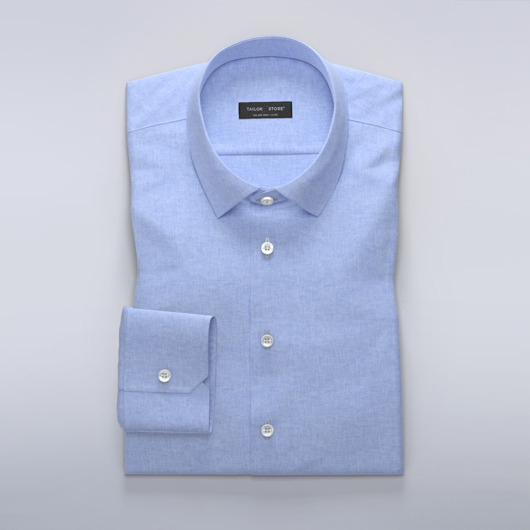 Order one of our recommended linen shirts, or make it a one-of-a-kind with our design tool. Whatever your preference, you can modify just about any detail. Why not try short sleeves, add a monogram, or switch out the collar. As with all our men’s shirts, your linen shirt will be made to your personal measurements. Linen is a fantastic natural material that is both durable and dries fast. Linen ages especially well becoming softer and softer over time. To make a shirt in linen easier to iron, we recommend a light spin cycle when wash it. Linen is one of the oldest and most beloved fabrics. Man has processed flax fiber and woven linen fabric for several thousand years. The oldest fabric fragment ever found was linen and is over ten thousand years old. Nowadays, linen is a material mostly used for casual summer shirts. Fine thread weave linen shirts are famous for their cooling effects. Mostly worn as casual shirts, linen shirts are especially popular for vacations and beach days. Linen shirts can absolutely be worn to the office if they are a single colour and are great choices for sunny cities.